Until the implant electric car on our streets and combustion engines, which will disappear at some point, the evolution goes through some intermediate paths as hybrids and plug-in hybrid. The automotive industry is constantly working on making more efficient engines. Nevertheless, the limit of petrol or diesel efficiency is already close, So the next step is to combine these engines with external technologies to make them cleaner with nature without giving up their power characteristics and autonomy. 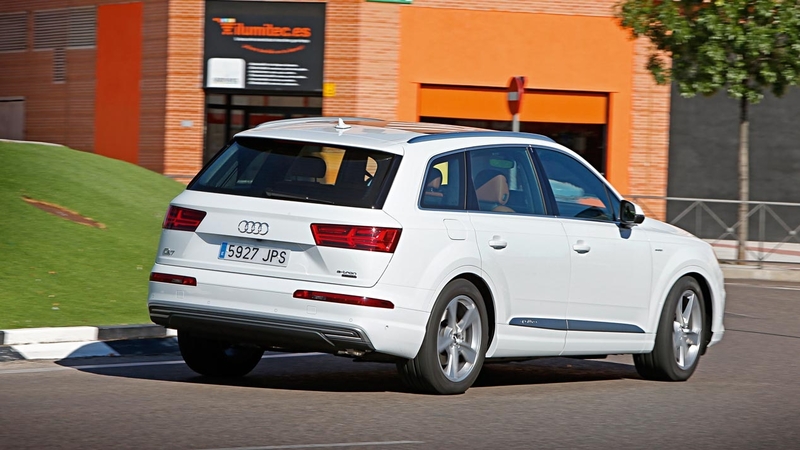 This is the case Audi Q7 e-tron, very interesting for all the technology that provides plug-in hybrid and because it is of the few (Volvo V60 D5 next to Twin Engine) It makes hybrid plug-in to a diesel engine. The Audi Q7 e-tron quattro uses V6 3.0 TDI from 258 horses, supplemented with other electric 94 kW located behind the gearbox, separated by a second clutch, additional torque converter 8 speed Tiptronic. Media has active engine, released by the RS6 and then by Porsche, which are constantly running and are responsible for eliminating vibration characteristics of the diesel engine. This system, combined with a mechanical isolation almost perfect, He manages to hide the usual personality diesel, sound or vibration can by going through a refined gasoline engine. The battery is lithium-ion, 17.3 kWh, and additional plug recharge. It also has an original heat pump which recovers thermal energy from electrical components and used to power the air conditioner, thereby reducing power consumption of the battery. 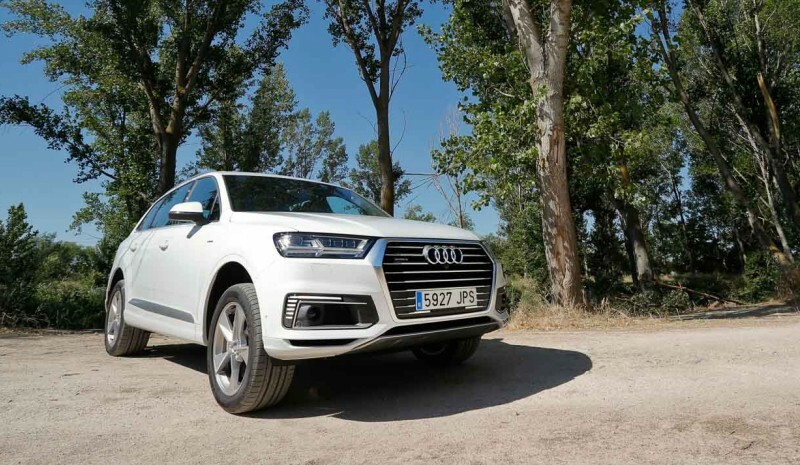 Standard features and quattro all-wheel drive option, as our test unit provides air suspension, an expensive extra (2,400 €) which makes the Audi Q7 e-tron a better car. All this efficient combination, coupled with the huge number of comfort features and size of the car, cause we have an actual weight of 2662 kilos, similar to the vehicle of this size 10 years ago and about 200 kg more than a delivery truck; pending issue if you want to be king efficiency. I understand that Audi has done a brutal effort to reduce weight, because the number of components that have should weigh more, however it seems exaggerated; today is the heaviest of those sold according to our measurements car. 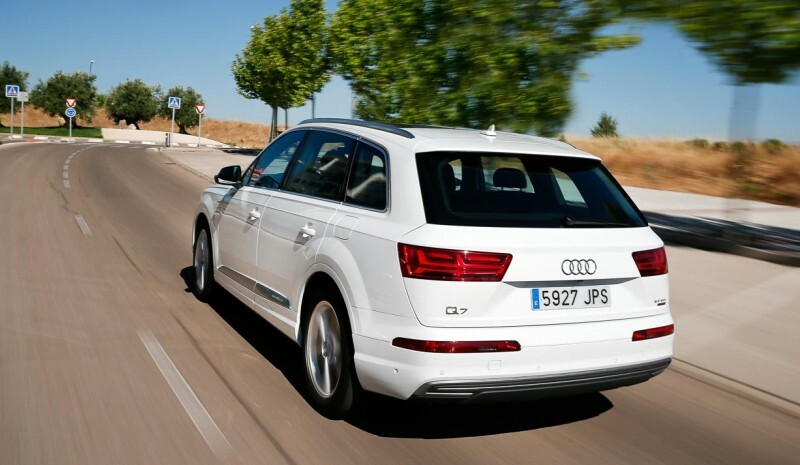 Life aboard a car like the Audi Q7 e-tron is sublime. Diesel engine is heard let alone the electric rolling insulation is very good and you feel like a comfortable lounge. The seats are very good, regardless of whether opt for extras such as massage or cooling thereof. The driving position integrates the driver and makes you think you're in a much smaller car, feeling that is complemented well with the steering operation or pedals and rear camera; It does not give the feeling of being a passing car 5 meters. The HVAC system immediately puts the car at the selected temperature, regardless of the place in which you are. Behind is set to three occupants, since the location of the batteries prevents provide the extra seven seats, yes leads rival the Volvo XC90, also hybrid, plug-and-wheel drive. 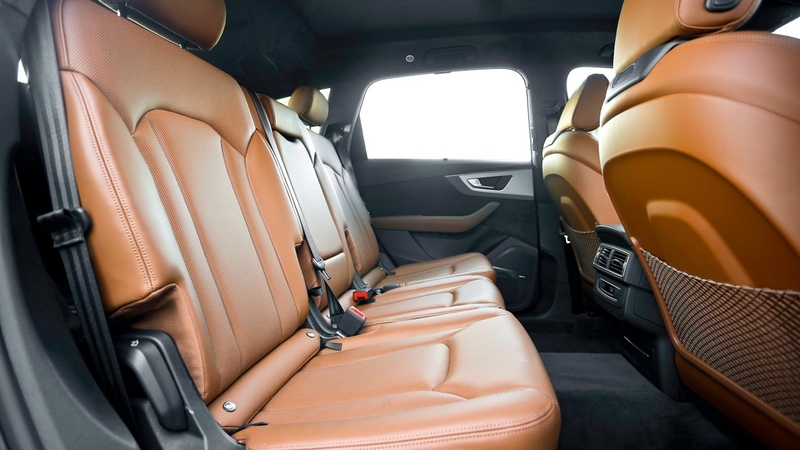 It takes over three separate seats that can be folded or moved lengthwise, whereby the trunk can go from 530-640 liter five seats usable. Although large, for the size that has the car trunk it is fair, 580-745 liters offered by the Volvo XC90. No additional space under the floor is more important detail in a plug-in car since there is no place to store your charger cable, occupying enough. The operation of the hybrid system I liked it, as long as the battery is charged. You get to go to 40-45 kilometers (after about 2 hours and half load) without starting the engine and a relatively normal driving, then consume about 7.5 l / 100 km. This is very nice. You can afford, depending on where you live and if you can charge every day, not to start the engine in months, with the advantages this has for the planet, and then have a more than acceptable for traveling wheel drive diesel. You can recharge the battery in place, selecting even with changing the charging speed, but keeping in mind that do spend more based oil; not bad if you do it to access restricted by pollution or which are controlled areas (Barrio de las Letras in Madrid for example) areas of large cities; the end offset and do not pay the ticket of O.R.A. Having exhausted the battery moves as a hybrid at the start of the march or when we accelerate, which recovers energy, so it is "little hybrid" car, nothing to do with operation type Toyota Prius. 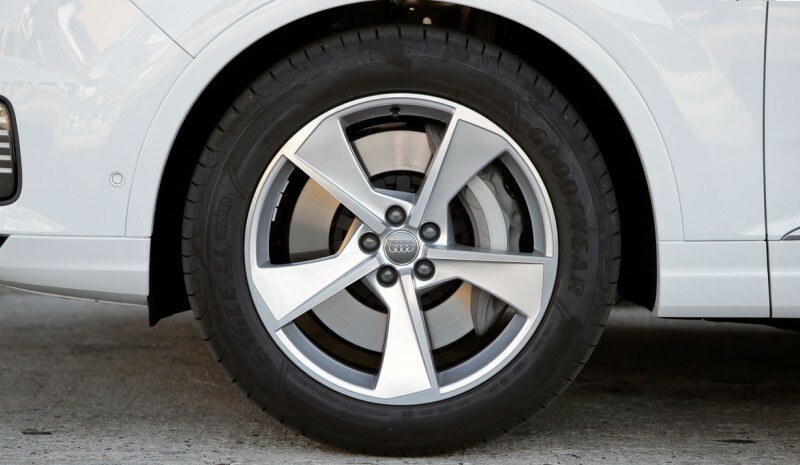 That's when diesel consumption of the Audi Q7 TDI comes out. Has very good performance and it moves nimbly despite the size and weight it has. With the air suspension hides very well the weight, which only comes up with firm delicate or ashore, moments when the tire suffer inertia. 7 has driving modes eco option, comfortable or sporty asphalt, for out of it or even to go through complicated trialeras, an automatic mode and a configurable to suit the driver. It affects the direction, management electricity, automatic transmission, the hardness of the suspension and its height and the engine. In Comfort mode the suspension is very comfortable, although retention leaves little extension, very American taste. Personally I prefer the sport, which is still very comfortable. The browser manages resources car depending on the route, activating the electric mode or engine as efficiently as possible. 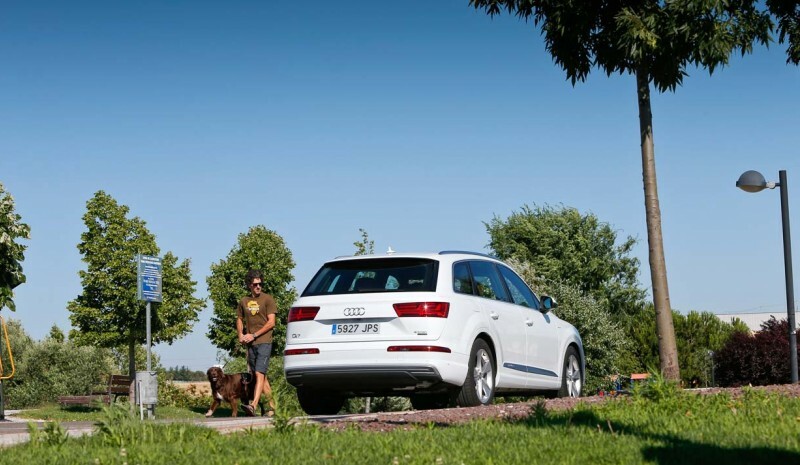 With respect to an Audi Q7 3.0 TDI with 272 hp and unhybridized, the e-tron consumes 1.1 liters less than half without an electric part, In addition difference if we increase the battery charged, as we can see averages of less than two liters easily the first 100 kilometers, then it is more efficient also offering similar benefits. The price difference with normal diesel is around 10,000 euros and you can not put 7 seats; in your hand it is whether or not make up, as for that money you can buy some 10,000 liters of diesel and will have to endure some 300 kilos less; buy this car is a matter of ecologically minded or advantages in your city, not consumption. Nissan Qashqai 2017: SUV-lederen endringene … og vi prøvde det!